YES, IT IS! > Is a “Like” Protected Speech? Is It Different Than Giving “The Finger”? To answer the question I asked in a blog post about a year ago, “yes, it is”! The First Amendment does protect a Facebook “Like” as free speech. In sum, liking a political candidate’s campaign page communicates the user’s approval of the candidate and supports the campaign by associating the user with it. In this way, it is the Internet equivalent of displaying a political sign in one’s front yard, which the Supreme Court has held is substantive speech. See City of Ladue v. Gilleo, 512 U.S. 43, 54-56 (1994). Just as Carter’s placing an “Adams for Sheriff” sign in his front yard would have conveyed to those passing his home that he supported Adams’s campaign, Carter’s liking Adams’s Campaign Page conveyed that message to those viewing his profile or the Campaign Page. I was recently asked my thoughts on the “Facebook ‘Like’ Case” on this blog’s Facebook Page and I decided that I would share my thoughts here as well given that this is such a burning issue in social media law. 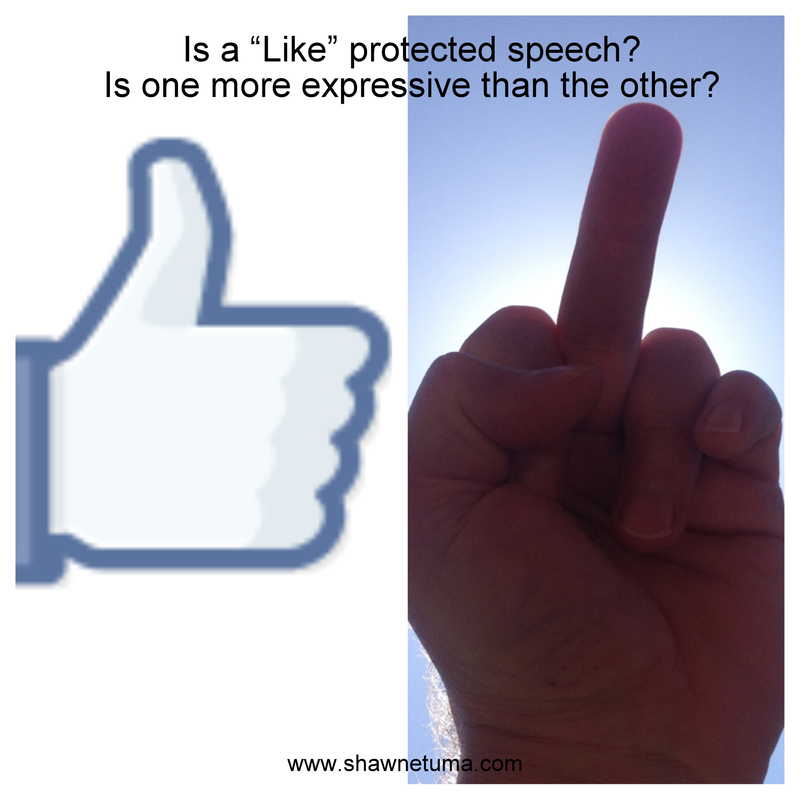 The short answer: I believe it was wrong for the court to find that a “Like” is not protected speech. The case we are talking about is Bland v. Roberts, 4:11cv45 (E.D. Va. Apr. 24, 2012) (click on the link for the opinion). There are a lot of issues in this case about which I do not profess to have any particular expertise but, the issue that has garnered the most attention is whether a “Like” can be considered “protected speech”. This issue has received a lot of attention and I am not really going out on a limb here because I agree with most of the commentators. The essence of the case is as follows: Bland was an employee of the Hampton Sheriffs Office, Roberts was the Sheriff, and when Roberts was running for re-election, Bland supported his opponent (Adams) and had “Liked” Adams’ Facebook page. Wanna guess what happened next? Yep – Roberts was re-elected and decided to clean house. Bland sued claiming that his “Like” of Adams’ Facebook page was protected speech. It is the Court’s conclusion that merely “liking” a Facebook page is insufficient speech to merit constitutional protection. In cases where courts have found that constitutional speech protections extended to Facebook posts, actual statements existed within the record. These illustrative cases differ markedly from the case at hand in one crucial way: Both Gresham and Mattingly involved actual statements. No such statements exist in this case. Simply liking a Facebook page is insufficient. It is not the kind of substantive statement that has previously warranted constitutional protection. The Court will not attempt to infer the actual content of Carter’s posts from one click of a button on Adams’ Facebook page. For the Court to assume that the Plaintiffs made some specific statement without evidence of such statements is improper. Facebook posts can be considered matters of public concern; however, the Court does not believe Plaintiffs Carter and McCoy have alleged sufficient speech to garner First Amendment protection. In my opinion a “Like”, like many other forms of expression (verbal and non-verbal) is considered speech and I believe the judge got this wrong and will be overturned on appeal. In the case Hackbart v. City of Pittsburgh, 2:07cv157 (W.D. Penn. 2009), the court found that “giving the finger” a/k/a “flipping the bird” to a police officer was protected speech under the First Amendment. While Hackbart was only a district court opinion, the authority upon which it relied was solid — the United States Supreme Court in Texas v. Johnson, 491 U.S. 397 (1989) — the case that held the non-verbal conduct of burning an American flag was protected speech. So the question is, if it non-verbal expressive conduct of burning a flag or giving the finger is protected speech, why isn’t a “Like“? On Facebook, you can give a “Like” by virtually pressing the “thumbs up” icon — is that really much different than non-virtually giving the iconic “middle finger up” gesture?